Every year I give flu vaccines. While working as a hospital Infection Control Nurse I literally gave hundreds of them. Each year I seem to hear the same basic fears expressed by various people in various ways by those who don’t want to be vaccinated. The flu shot gave me the flu once, so I don’t want to have it again. Sorry, but this is not true. The flu shot contains no living influenza virus. You simply can’t catch the flu from it. Sometimes you may have flu-like symptoms related to your immune response as it creates antibodies to influenza. But, if you truly contracted influenza, it was because you were exposed to it before you had the vaccine, or during the time your body was producing immunity. It has harmful chemicals and preservatives. I’m more of a “natural medicine” person. If you’re concerned about these issues, please talk with your healthcare provider. Influenza vaccine is available in a preservative-free form and exposure to this tiny amount of vaccine serum is relatively free from risks. The benefits to you, your family and community far outweigh the risks. I’m healthy enough that I don’t need the vaccine. I’m pregnant. It might harm my baby. Wrong. In fact, pregnancy is a good reason to be vaccinated. Your unborn child will be able to fight influenza in her early weeks of life via passive immunity from you. [You really should click that link. It’s a short, fun and informative.] If you breastfeed, she’ll be protected even longer! This is a tough one. Some people have legitimate phobias about needles. Your healthcare provider can help you cope with anxiety and fears about getting a shot. And remember: many nurses and doctors use tried-and-true methods to help make injections less painful. We can also help distract you from the source of your fear long enough to give the shot. We care about your fears and we’ll do anything we can to help you get through those few moments it takes to receive an injection. Give us a chance, okay? Let’s all be brave this year. Protect yourself and your loved ones by being vaccinated. Are you or your parent or grandparent home-bound? Do you need a flu shot? Call Envision Home Health and Hospice for a free flu shot today. 1-866-471-5733. We’ll send a nurse to administer the vaccine right in your home! 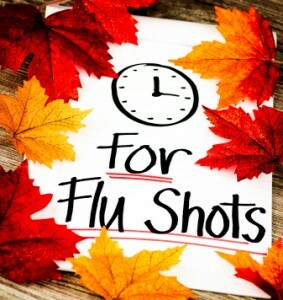 Visit this Envision blog post for more fun and fascinating flu facts! This entry was posted in Aging, Home Health, Nursing Care and tagged elder care, Flu Vaccine, healthy living, immunizations, loved one, prevention, vaccination on November 14, 2013 by Melody Newey.